Jesus found his way back. Thank God. It’s not what you think. Actually, I have no idea what you think. Jesus is really Israel. And praise the lord I have friends who spy on my house or I would never have known Israel was even there. Confused? I bet….Israel, you see, is the tile guy who was at my house in Sharon, Ma. today finishing the tile work on my bathroom that has been under a remodel for two months. Israel drives a truck that says in bold letters across the back, “My GPS Is Jesus Christ.” If you ask me, Israel was heaven-sent. Before delving into a discussion about why my house is still being remodeled, I need to turn the focus back to Israel, er Jesus. Israel, the Brazilian tile dude, is in seminary school studying to become a minister. So this explains his truck and the reason why he says a prayer for everyone. I didn’t make this up. I couldn’t have if I tried. We kind of like having him around. It’s not his fault that he disappeared for a month. In fact, the bathroom was supposed to be finished three weeks ago. But, as Joel likes to say, these types of jobs are always one-and-a-half times the estimated cost and take twice as long to complete as they’re supposed to. It doesn’t matter how much praying you do. On time construction projects are damn-near miracles. So far he’s been right on both accounts. In defense of Israel (don’t worry – this blog is not going all political on you), he’s not the general contractor and he could not complete his part until the other parts were done and ready to go. If any of you have ever remodeled a kitchen or bathroom, you certainly know what this is like. You could be sitting around waiting for days or even weeks for an electrician, plumber, painter or another key player to show up. In the meantime, fast-food becomes your friend and cramming the whole family into one bathroom becomes the norm. Not that I am complaining about the bathroom situation, especially seeing as my toileting facility in New York is tinier than the smallest bathroom in my house. I share my NYC bathroom with Noah and sometimes my husband. I should clarify: Joel is always my husband, but he only sometimes stays with us in New York and shares the bathroom. 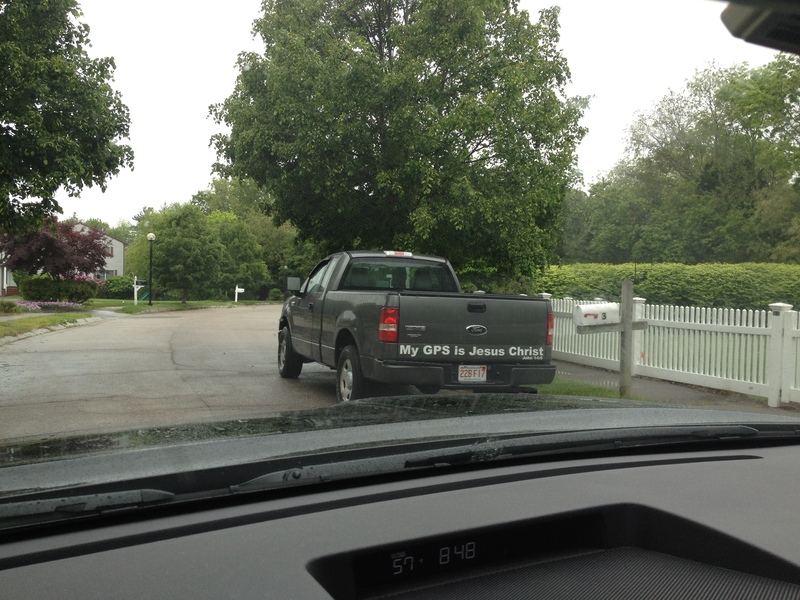 But TODAY, the Jesus Saves truck was parked in front of my house! Hallelujah. How did I know this? Heidi, the new manager at Breathe Joy Yoga, drove by to teach her yoga class and saw the truck. Religious about keeping a vigilant eye on the comings and goings around my house, she snapped a picture, texted it to me with the message “Jesus Is Back”. “Praise the Lord” I texted back. I called Joel and he confirmed the good news. Israel showed up bright and early. It turns out that he needs to replace a bunch of tiles because the stone wasn’t installed correctly. Welcome back. I know how it feels. When we had a construction company build our house, they didn’t show. When they did show up, we found empty beer cans! So my father-in-law could not resist and helped us by making sure if someone was there that they weren’t drinking. Finally the house was finished. What in world did I learn? Gosh………….. practice patience. Today, my email campaign went out 3 ties due to the companies error so all my email subscribers got 3 duplicates. “oh my” my mind thought – over and over again… “they are going to unsubscribe or report it as spam.” – So I found myself, frustrated. Took some long breaths and I’ve got to let it go. Things don’t go as they are always planned. Everything is placed in our way as obstacles to teach us lessons. Anyway, welcome back and I’ve told my students to go check out Breathe Joy Yoga – such a beautiful studio!!!! I hear ya Mimi! By the way I reported your email as spam 🙂 KIDDING!!!! Thanks for reading! !